The eastern Great Plains area which became the state of Kansas was originally the home of nomadic Native American tribes who hunted the vast herds of bison. The region first appears in western history in the 16th century at the time of the Spanish conquest of Mexico. Spanish conquistadors explored what is now known as Kansas. 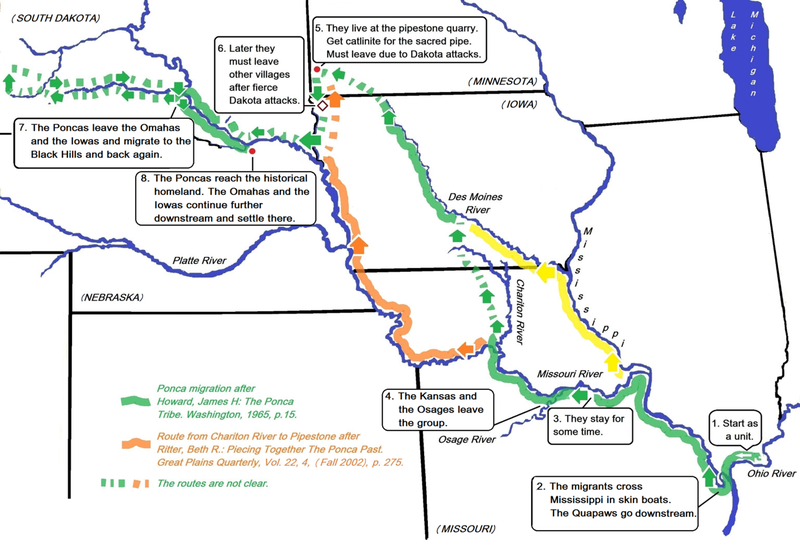 It was later explored by French fur trappers who traded with the Native Americans. 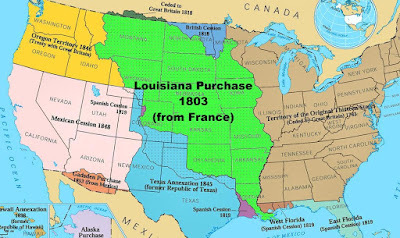 Most of Kansas became permanently part of the United States in the Louisiana Purchase of 1803. 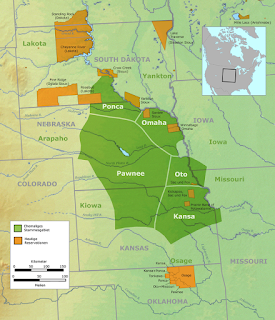 At that time, the northeastern corner of what is now Kansas was inhabited by the Kansa tribe, also known as the Kaw. 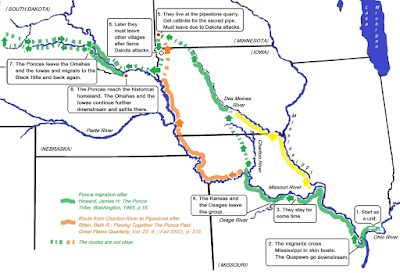 They were closely related to other tribes that settled in the region—the Osage, Ponca, Iowa and Omaha. As for the Americans, after a brief period as part of Missouri Territory, Kansas returned to unorganized status in 1821. 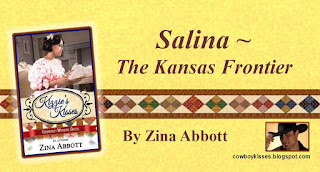 Also in 1821, the Santa Fe Trail was opened across Kansas as country's transportation route to the Southwest, connecting Missouri with well-established Santa Fe, New Mexico. Because of the growing trade, the United States Army set up posts throughout the area. 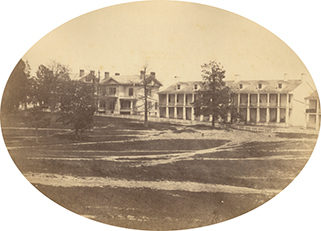 On May 8, 1827, Cantonment Leavenworth, or Fort Leavenworth, was built to protect travelers. 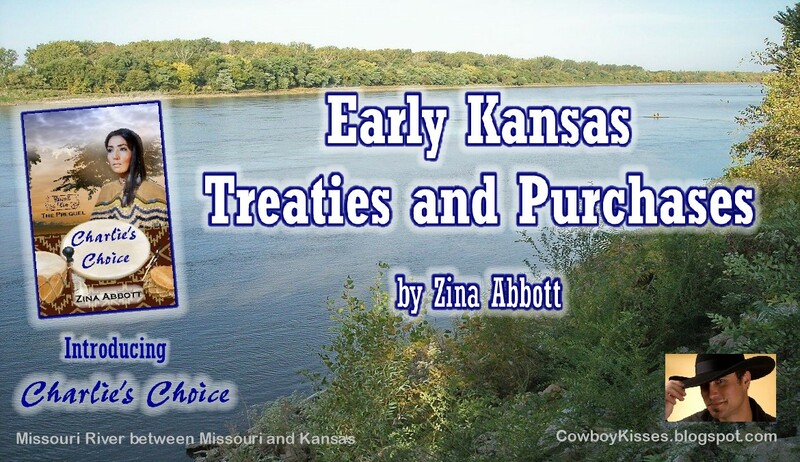 In 1825, The Kansa entered into a treaty whereby they gave up their lands in the Kansas Territory. 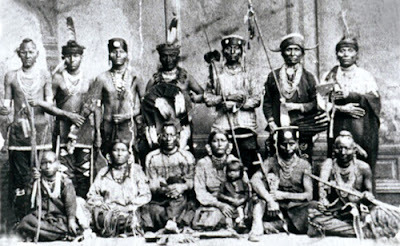 In 1825, the tribe ceded land in Missouri to the United States and move to a reservation in Kansas. 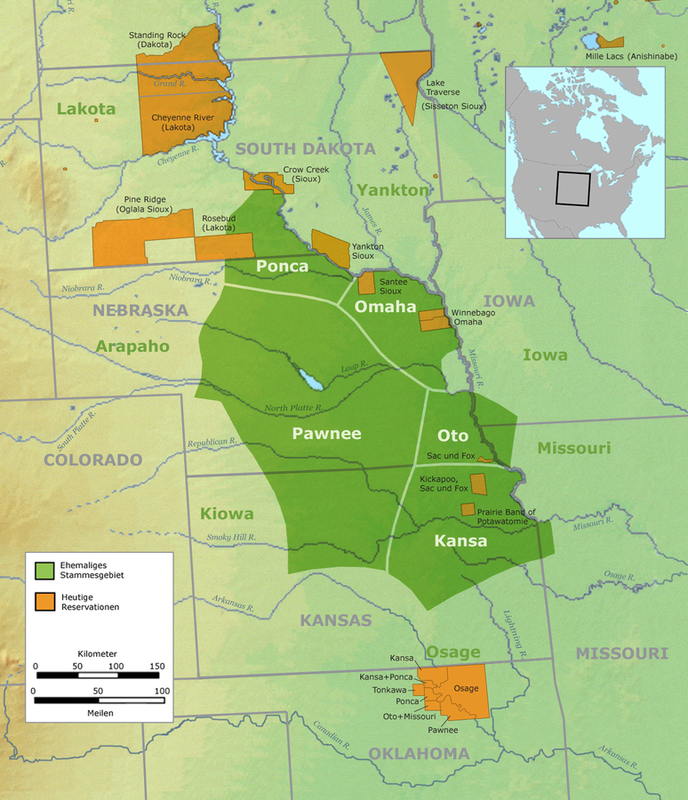 As part of the Indian Removal Act of 1830, their territory was reduced to make room for other tribes from the east being forced to relocate to Kansas. In 1836, they joined with other tribes in more treaties with the U.S. Government. 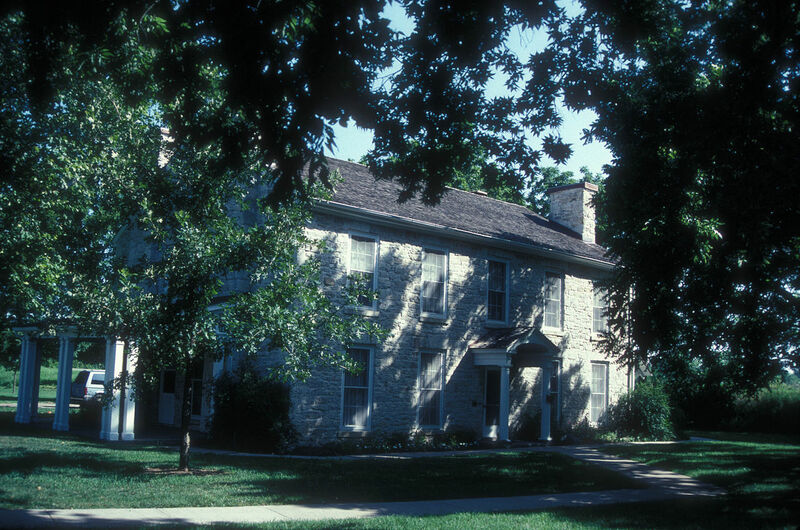 Poverty-stricken by the failure of the 1825 treaty and weakened by continuous government pressure and pressure from railroad, town and land speculators, the Kaw leadership went to the treaty table again in 1846. Arrogantly, and tragically indicative of racial attitudes of that time, Indian Superintendent Thomas Harvey in St. Louis boasted to his superiors in Washington that he could work out a new deal with “the degenerate and docile” Kaws in a matter of five days. This he did in 1846 with the help of Indian Agent Richard W. Cummins. 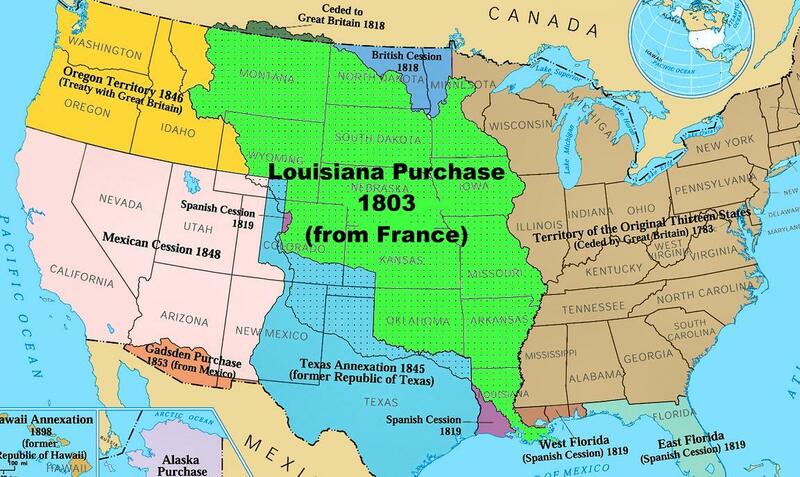 The 1846 treaty required the sale of the 2 million-acre reservation to the government for just over 10 cents an acre. The Kaws agreed to a reduction of their 20 million-acre domain, comprising roughly the northern half of future Kansas, to a 2 million-acre reservation known as Council Grove on the Neosho River which was 30 miles wide beginning just west of future Topeka and extending west to a line to be marked by government surveyors. For this huge cession the Kaws were awarded a $3,500 annuity for 20 years, a quantity of cattle, hogs and domestic fowl, a government blacksmith and agricultural instructor, and schools to be funded from earlier Kaw land sales in the Kansas City area. The reservation at Council Grove, it was plagued by squatters who relied on the Preemption Act of 1841 and shady promises of the local Indian agent that claimed the boundaries were incorrect. They moved in on farmland intended for the Kansa to grow their crops (The Kansa women had been growing corn and other crops since before the coming of the white man.) to eventually claim the right to purchase Kansa reservation land once it was opened to white settlement. The exception was the land granted to 23 half-white, half-Kaw members of the tribe, a topic for a future blog post. Congress began the process of creating Kansas Territory in 1852. By the summer of 1853, it was clear that eastern Kansas would soon be opened to American settlers. The Commissioner of the Bureau of Indian Affairs negotiated new treaties that would assign new reservations with annual federal subsidies for the Indians. 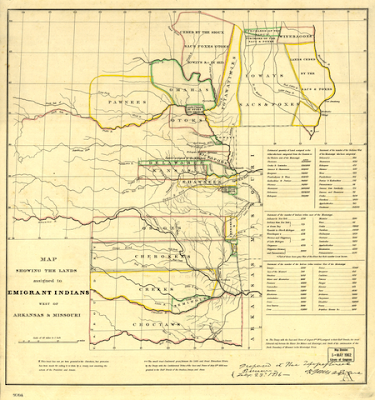 Nearly all the tribes in the eastern part of the Territory ceded the greater part of their lands prior to the passage of the Kansas territorial act in 1854, and were eventually moved south to the future state of Oklahoma. 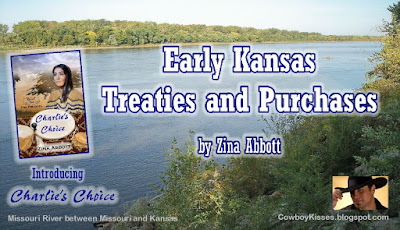 The Kansa on their reservation in Council Grove were not included. However, it was only a matter of time. The U.S. government pushed for the Kaw treaty of 1859 (ratified in 1860) which allowed the tribe to keep only 80,000 acres of the poorest land, to be subdivided into 40-acre plots for each family head. The remaining 176,000 acres were held in trust by the government for sale to the highest bidder. 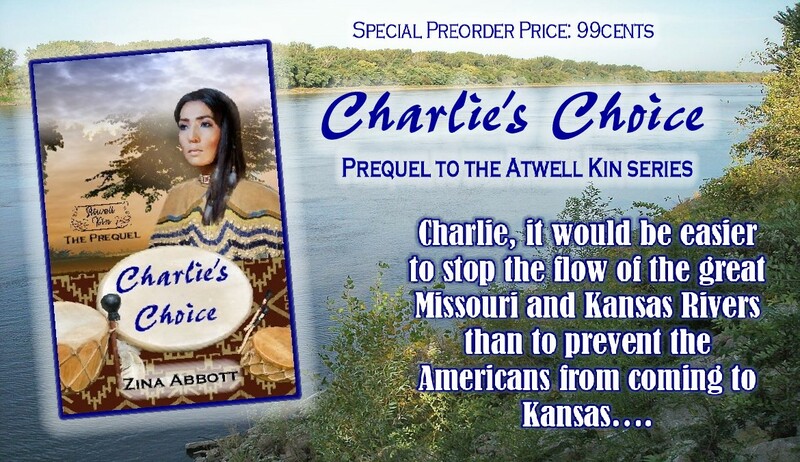 Forty acres of marginal Kansas land was wholly insufficient to support one Kaw family, and by the late 1860s the government was obliged to authorize emergency funds to prevent outright starvation of the Kaw people. Finally, on May 27, 1872, in a measure strongly opposed by Chief Allegawaho and most of his people, a federal act was passed providing for the removal of the Kaw to a 100,137-acre site in present-day northern Kay County, Oklahoma, which was carved out of former Osage land. 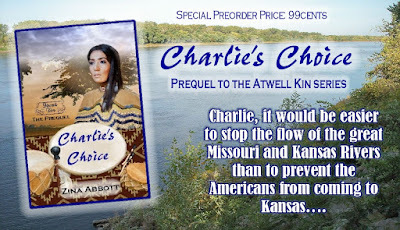 It was while writing for Kizzie’s Kisses, Book 2 in both the Grandma Wedding Quilts series and the Atwell Kin series, I learned about the Kansa/Kaw tribe since I wished to know what tribe had inhabited the land where my 1860's American farmers settled. 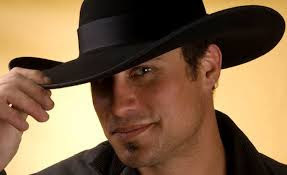 Much of this blog post was taken from my January, 2017 Cowboy Kisses post. You may read that entire post by CLICKING HERE. If you have already read Kizzie's Kisses or Otto's Offer, you know who Charlie is. 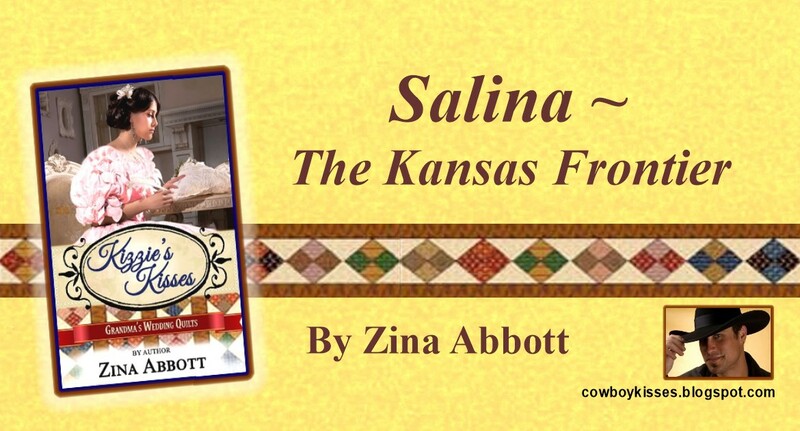 This is his story and his romance which takes place 1856-57. He is the link to remind us that before the white Americans came to Kansas, a tribe of people already lived there. 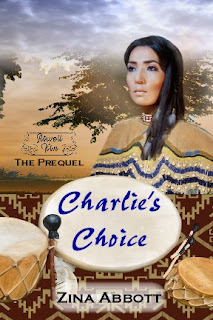 To read the book description and find the purchase link for Charlie's Choice, please CLICK HERE.